“Sol” the French bulldog returns to his original owners. Photo courtesy of Oceanside Police Dept. OCEANSIDE–A stolen French bulldog was returned to its owners after someone took the puppy from the family’s home. On January 17, the Oceanside police department responded to the 3900 block of Shenandoah Drive to investigate a report of a 2-month-old stolen French bulldog, named “Sol.” The victim reported someone had broken the locked latch off the gate and pulled the fence apart and took the dog. The family had recently purchased “Sol” for $3,500 just a few weeks prior. The family was devastated at the loss and their two daughter ages 7 and 10 have cried themselves to sleep since their dog disappeared, according to Oceanside police department. The victim located the dog for sale on Craigslist for $1,200. “Sol” is brindle/blue with blue eyes with unique white markings on his chest. The victim immediately recognized her puppy. The victim attempted to contact the seller on Craigslist, letting them know this was her daughter’s puppy and would pay a hefty price to get him back. The seller did not respond and immediately took the posting down from Craigslist. Oceanside police detectives from the Property Crimes Unit made attempts to contact the seller but there was no response. They located the seller in an apartment complex in Escondido. He initially denied any knowledge of the puppy. After a short time of inconsistent statements the man changed his story, according to investigators. The seller stated he found the puppy “on the side of the road.” He admitted he did not make any attempts to locate the owners, call the Humane Society or police. The suspect told investigators he sold the puppy to a person from Fontana. Through additional investigative follow-ups, detectives located the person in Fontana who purchased the puppy. The owner resold the puppy to a person in Hemet. The puppy was eventually located in a home with a couple of full grown French bulldogs. Detectives explained the circumstances to the new owner, and she was understandability upset, but knew the right thing to do. She emotionally, but gladly gave up “Sol” so he could be reunited with the original family. 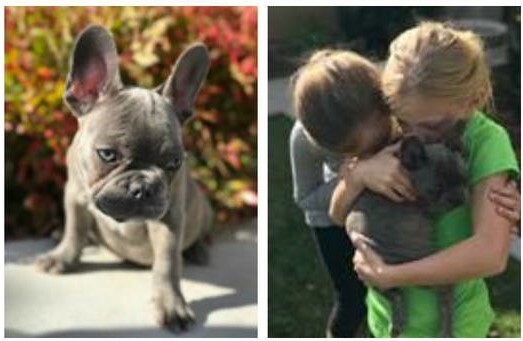 She has since been given another French bulldog puppy by the couple in Fontana to replace the puppy. Detectives drove the puppy to where the original owners were anxiously awaiting his return. “Sol” had an exciting week of travel around Southern California, but is now safe and snug with his two best friends. This case will be forwarded to the District Attorney Office for review for a violation of Grand Theft of a Dog over $950.